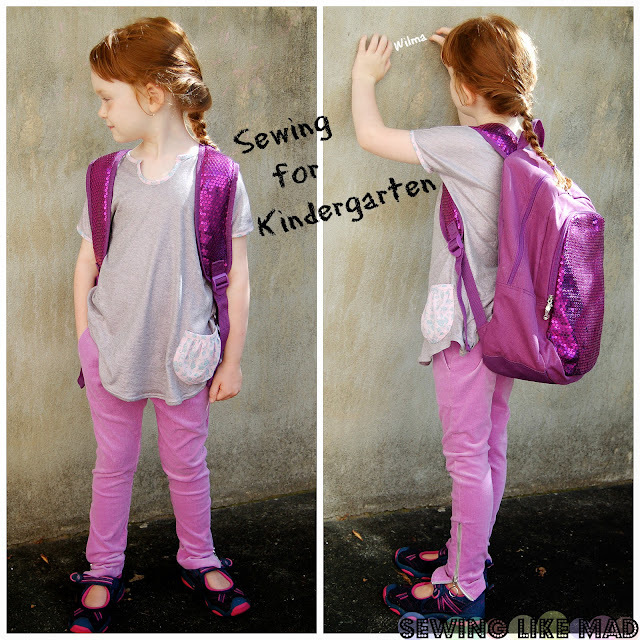 Sewing Like Mad: Sewing for Kindergarten...Here we go! Are you ready for almost four weeks of school clothes inspiration? All presented on kids who are starting Kindergarten these weeks. 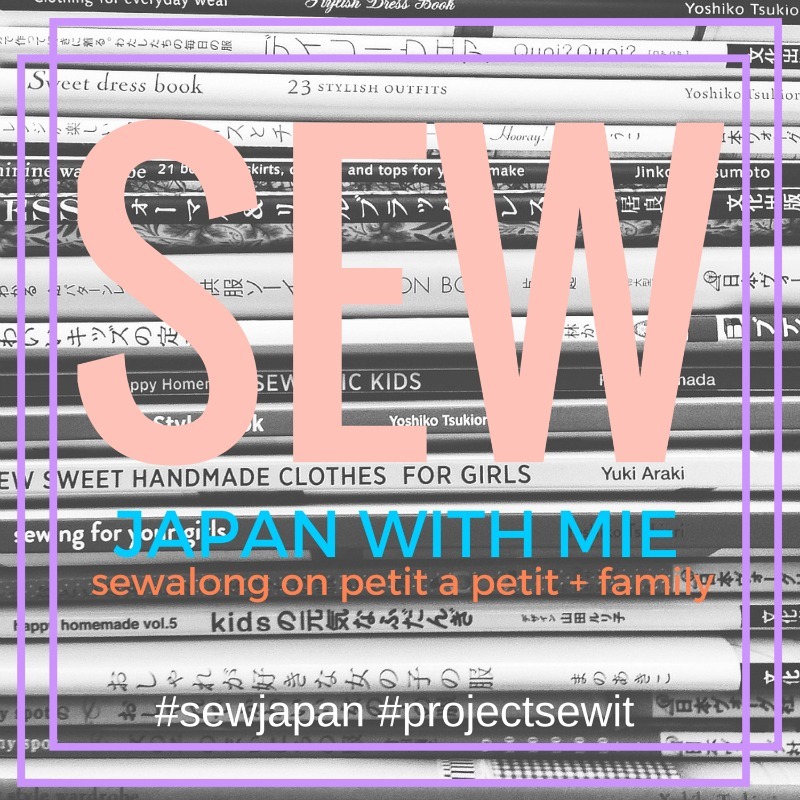 THIS previous post will tell you all about my inspiration, the amazing lineup of bloggers and their kids (or nieces) who are participating AND the sew along where YOU can win amazing prizes from this series generous sponsors. See their adds in the right column. So I had plans of making her 5 outfits (monday to friday, get it!) but my exciting participation in Project Run & Play made me cut down on the ambitions a little bit and ended with 3.5 outfit aaand I am pretty sure we will be able to find something 'old' in the closet for the other days, ha. Here you see a t-shirt that is ehhh very closely inspired by a COS t-shirt she has used a lot. I don't very often copy clothes directly because well, I actually find it kind of easier to draft the pattern myself but this one is so simple yet so perfect and it was exactly what I wanted....so sorry and thanks COS! 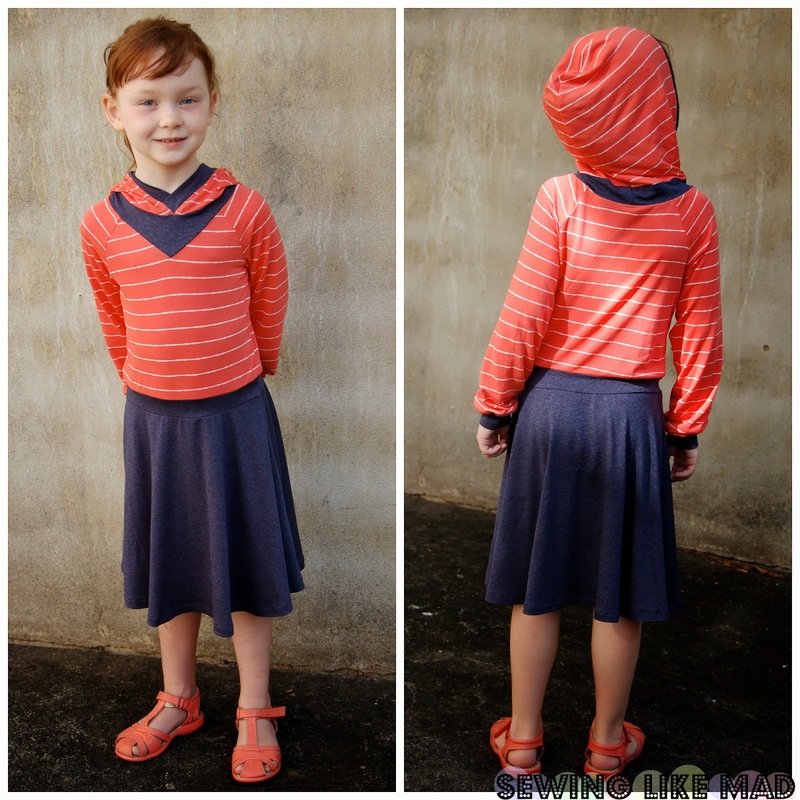 The fabric is this ultra soft and drapey knit from Girl Charlee. And then I made her a pair of very wide culottes in this thin light denim with elastic waistband and in-seam single welt pockets. 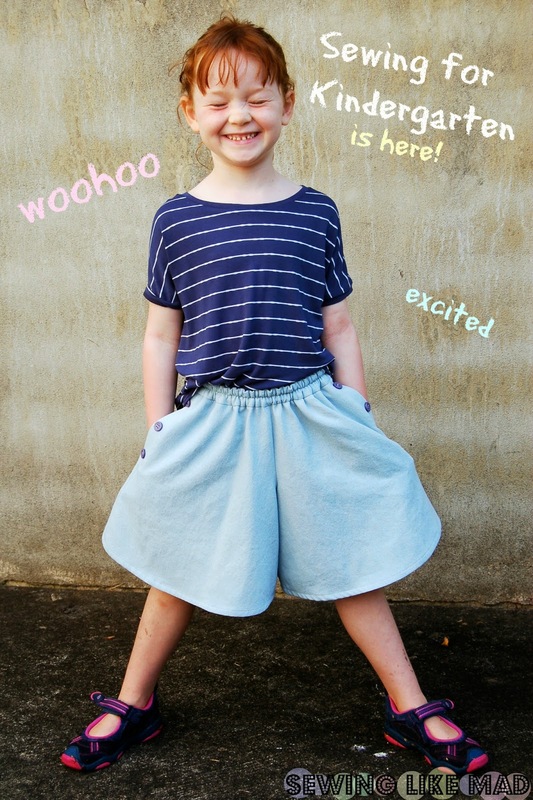 I have tutorials for both culottes and the pocket on my tutorial page. 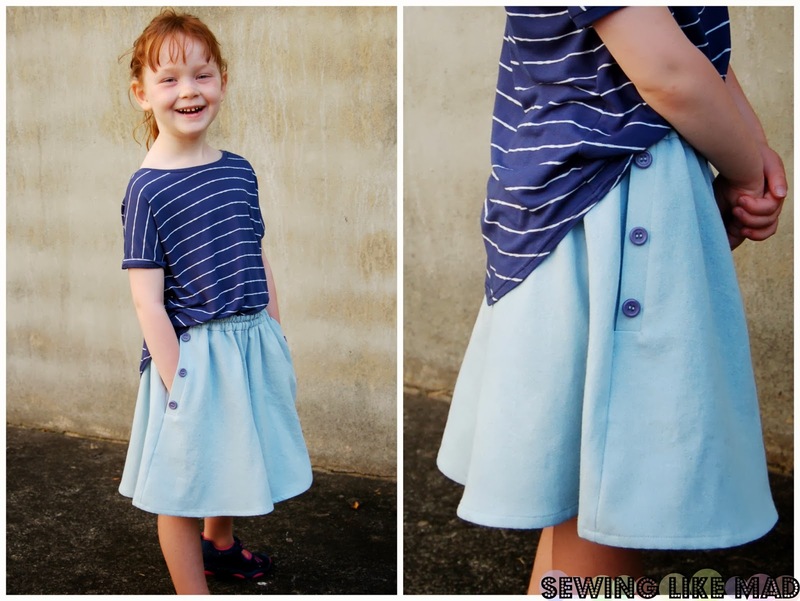 And some of you might think that sewing the buttons on the outside of the welt like that is a bit cheating but I knew she would be annoyed if she had to button and unbutton every time she would use the pockets. They would either stay unbuttoned or the pocket would never be used so instead I simply sewed them outside the pocket welt as decoration. They are from Lots of Buttons. Another funny thing with the buttons...I could not decide which ones to put on. 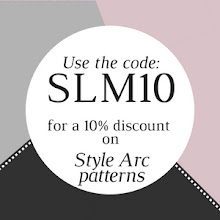 Lots of Buttons have sent me the most beautiful selection (to die for, right!) and I wanted them all but none of the ones I tried was exactly right. The only ones in the right size that I did not consider was the purple ones. They were Wilma's idea..... and hey they were exactly perfect. Go Wilma! 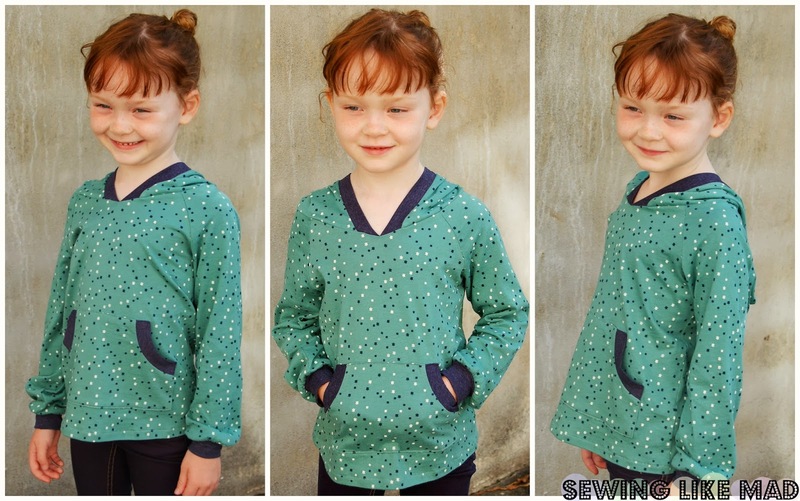 So when I told Wilma I was going to make her some new knit dresses she requested long sleeves and a hut soooo Mommy here had to do a bit of pattern alteration. And of course that blue part around the neck was not supposed to be there, ahem, but I like it. One of those many lucky mistakes. Sometimes you got to not focus on the actual mistakes but how you fix them afterwards, right! Definitely goes for sewing! The red knit (like the blue from the previous outfit) is from Girl Charlee and the 'denim' blue is from Mood. Both ultra soft and have perfect drape for clothes like this. I also bought this great green knit fabric with navy and white stars at Mood and I always thought I would make one of those knit dresses with it. But I did not have enough fabric when she wanted long sleeves and a hut so I decided to go for a t-shirt with a kangaroo pocket. This time I fixed the pattern before I cut the fabric and so no extra neck thingy was needed. Yeah, at least I am learning from my mistakes, right! The contrast fabric is the same 'denim' knit as from the previous dress. This was actually the t-shirt she ended wearing on her very first day last week. I really wanted her to totally decide what to wear that day (well, you know as long as it was appropriate school and weather wise) and I was soooo hoping she would choose some of these new things I made her...and I guess I was lucky. 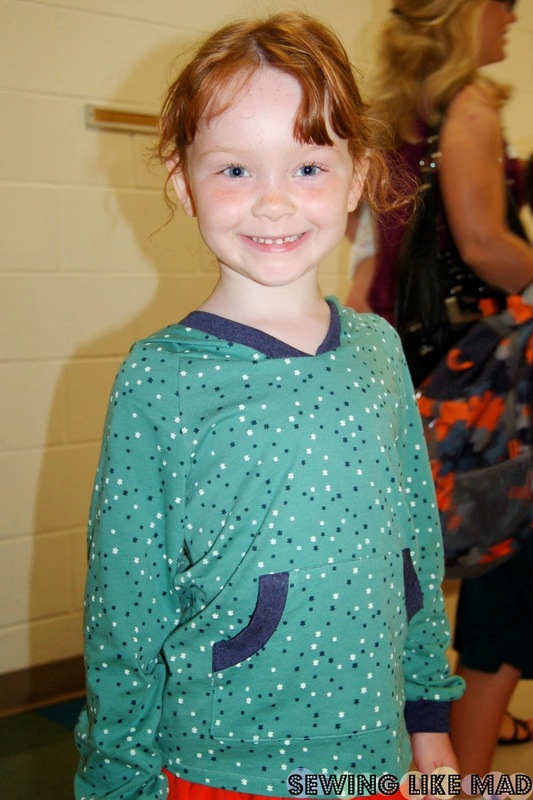 Here she is in the hallway on the way to her class room. Her school did a staggered entry so she was in one day last week floating around to all the teachers in a small group of 6 kids and in the end of that week did we go in to the final 'meet the teacher'-meeting. 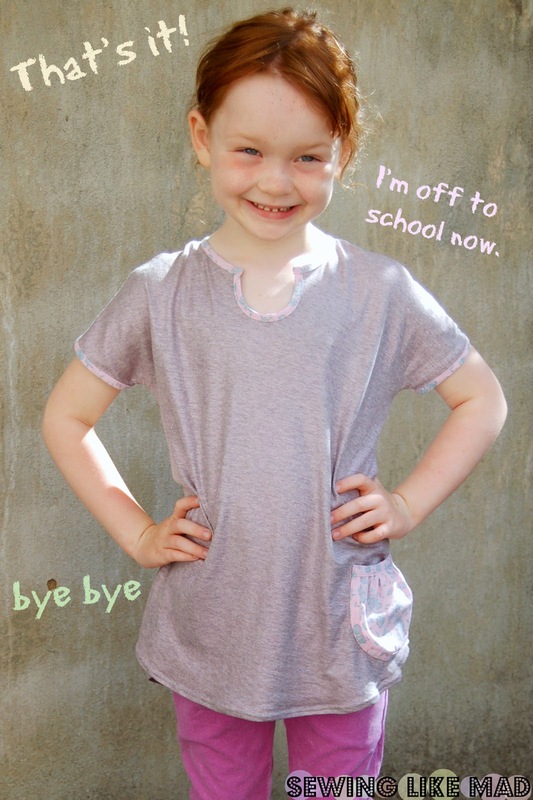 Today is her first real real day with her real teacher and real class and ohhhh joy (I hope!) taking the school bus. Seriously she has been talking about that school bus for the last year. I think there would be riots if I suggested to drive her, ha. And last but not least what might be my favorite outfit I made for her. Maybe also hers because she ended up wearing this the rest of the day after the photo shoot. The t-shirt is basically the same as the first outfit but with a little neck cut-out, bias tape and a pocket. The amazingly cool grey knit with a coating of pinkish shimmer is from Mood. The second Wilma saw that fabric she claimed it for her - non negotiable. Okay! And the pants - oh the pants. I really hate the world jeggings...but never the less that is what they are. Leggings made with a woven stretchy material. This is super stretchy purple, or is it actually fushia?) cotton corduroy from Mood (yup, that Fabric Weekend had LOTS of good outcomes! )....friendship and fabric wise. I had already decided to put visible zippers in before I saw Celina's (from Petit a Petit and Family) epic Pattern Anthology contribution but that did not prevent me from thinking of her when I was sewing the pants. I put mine on the outside of the leg. With all the work I usually find that sewing visible zippers is, I wanted to show them off for sure, ha. A little close up of the details. The jeggings (argh) have simple classic side pockets and an elastic waist. Not really interesting enough to show off, ha. But the zippers and t-shirt pocket...sure! Since you all know by reading the intro to the post that announces this series that Chelise Patterson was the one that inspired me to do this series so I am happily sharing the honor of starting up Sewing for Kindergarten with her. Make sure you do not miss her first post since April...and the amazing things she made for her daughter Drew!! And come back again tomorrow for more Sewing for Kindergarten! I love everything you made! Swoon! I love every one of these outfits Mie! So wearable and perfect school clothes. Fantastic! They are all great outfits! I especially love that knit dress, the neckline is very interesting, something you do not normally see. It may not have been what you planned, but it really does look fantastic! Wow impressive Mie, and Wilma is so darn cute! The zipper jeggings are my favorite! But I love all of it... classic yet super cool. You made so much!! SO MUCH!! and it's all awesome. I love LOVE the zipper detail on those jeggings (that is a dumb word...) the most. It's all fabulous, and your daughter is adorable! And now I feel like I need to sew a couple more outfits. Wonder if I have time??? Wow. I'm in love with that last outfit! 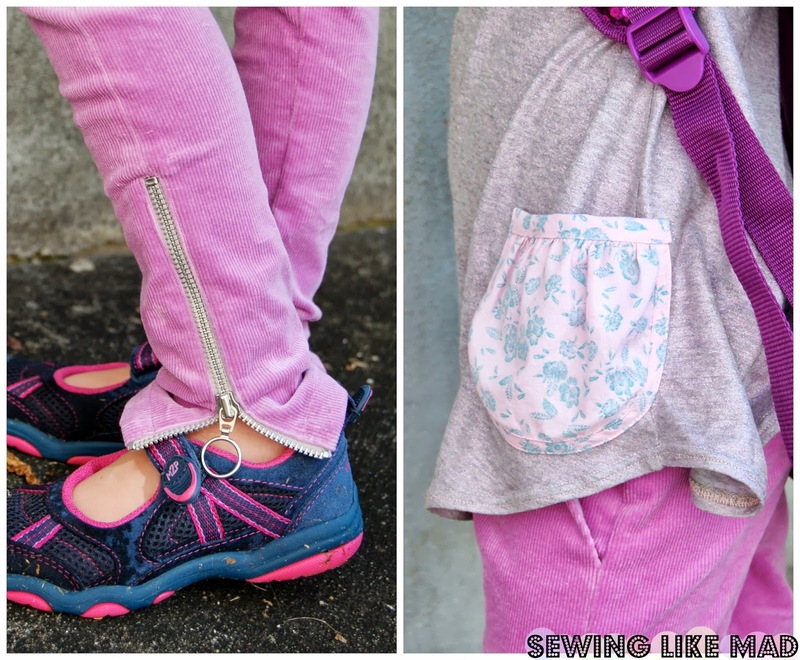 It's quite chic for a child BUT the flowered pocket gives it a nice soft touch. And i really love that yoke on the red & white shirt. What a great touch!